Is Asheville emerging as the next Austin? The new hipster cities of America: Who’s emerging as the “next Austin”? In Western North Carolina we are around 5% above our long term norms. Mortgage payments have dropped 10% since 2004 and the average monthly mortgage payment for a median priced home is now $849 compared to $924 in 2004 making housing more affordable. We will continue to see distressed sales playing a role in keeping home prices down. The area also has inflated home inventory this which keep the “buyers” market in place through the year. However, home sales are starting to pick up and hopefully, by the end of 2012 we will see the local housing market start to stabilize. This is the first time we have thought this since 2006!! A great article discussing where the housing market stands and if it really is turning. In determining if the median American family can afford the median house, there are at least two separate factors to consider: (1) how affordable is the typical down payment? 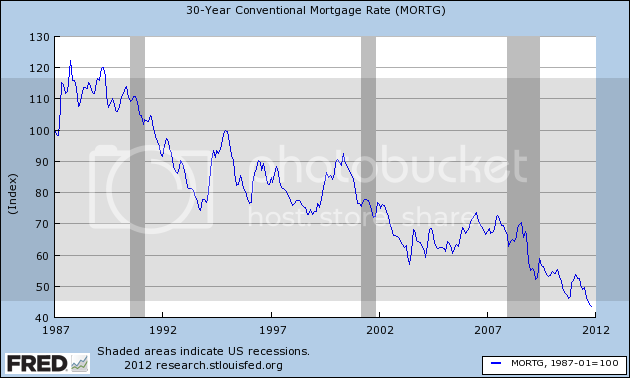 and (2) how affordable is the mortgage? Let’s look at each of them in succession. The down payment, of course, is a percentage of the sale price of the house. So if, for example, we want to know how affordable a 20% down payment is, all we have to know is the sales price of the typical house, because then we can just divide it by five. So, there are at least two answers to the question “how affordable is housing?” The first answer is that, in terms of down payments, house prices are probably very slightly — as in 5% or less — above their long term norm. Since it is mainly lower priced housing that is selling, it is possible that higher priced housing will continue to decline in price and if so, there will be an overshoot to the downside (which is good for home buyers). The second answer is, that at least in terms of mortgage payments, now really is a good time to buy a house. We are probably at or near generational lows in affordable mortgage payments, particularly after factoring in family income. Stunning Arts & Crafts home in the heart of Montford, located on level front & back yard on a quiet, non-through street. Winner of the 1998 Griffin Award and offers a remodeled kitchen w/ gas stove + stainless steel appliances. Oversized and restored windows, original re-finished heart of pine floors, 4 wood burning FP’s, large bedrooms, sleeping porch off Master, updated plumbing & electrical. Zoned heating & A/C upstairs. An easy stroll to downtown Asheville makes a perfect fit for everything Asheville has to offer!